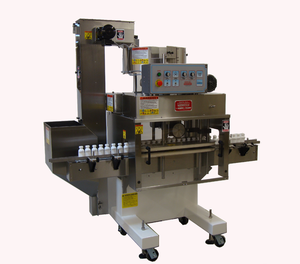 Fully automatic Capping Machine requires only 32" of line space. Fully automatic exclusive patented design is ideal for roll-on deodorants, perfumes and similar applications. Portable on heavy-duty casters. No container—no ball dispenser. No timing screws or timing mechanisms required. Stainless steel rotary ball feeder. No change parts for most container styles and sizes. Straight line continuous motion. Available with several hopper styles. Comes with or without conveyor. Stainless steel guard enclosure with Lexan doors on front and back enclosing spindle and gripper section down to conveyor. Stainless steel 7’6” conveyor frame DC variable speed drive with a 4 1/2” wide Delrin chain with stainless steel pins, stainless steel drive and idler shafts with reinforced nylon conveyor rail posts, stainless steel conveyor end guards and non-corrosive drive and idler conveyor top chain sprocket. (left to right travel standard) Note: (Machine also can be purchased without conveyor). No bottle/no ball release from chute.